Q1 – Where did the idea for IMAGINZ come from? A – Some years ago a member of the Jakaar team was snow bound at an airport in the US. He rang a friend and was offered accommodation to wait out the passing of the snow storm. While staying with his friend one of his host’s children was peering through the frosty window at their play house and longingly lamented if they could only bring the playhouse inside. The germ of an idea of a portable playhouse for indoor-outdoor use was planted. 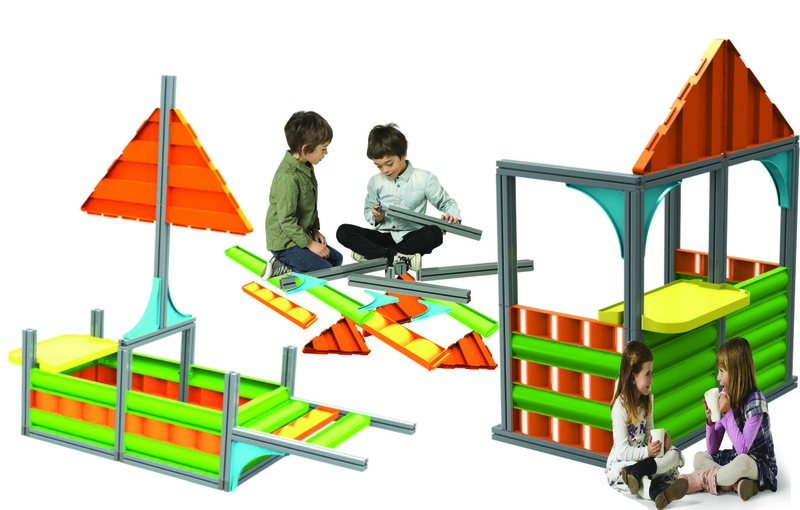 Q2 – What changed to have IMAGINZ become a product where you could build a playhouse but also lots of other structures? A – Having decided that a playhouse system was worth looking into we conducted research which told us the concept of playhouses often had firmly held expectations and memories of what they should contain and look like for the potential buyer. The research also identified there was potential for a construction product which could be used to build many different structures, one of which could be a play house. Q3 – How was the size of the product decided? A – Again we were guided by the research which was giving us a possible age range of use by children, of Early Childhood Education (ECE) through to Primary School age (perhaps High School); from this we designed the product to have a size which would have components which were comfortable for the age range to handle, manipulate and interact with. Also important was that the built structures were robust and strong enough for this age group to stand, sit and climb over and through. Q4 – How will children benefit from constructing with IMAGINZ? A – With our research we have come to understand a lot about how children will benefit from the experience of constructing with IMAGINZ. There is a universal rule that children very much enjoy constructing/building things hence our logo “The Joy of Making”. As humans it defines who we are to be inquisitive and wanting to understand our environment and put our own interpretation on it. The product allows the expression of this very basic human instinct enabling children to engage, interact and make sense of the world around them. Some might even say this has been lost to a degree with television and some toys which have predetermined start and end results. IMAGINZ returns the opportunity to create on a large scale to children. Q5 – What will IMAGINZ bring to my Early Child Education (ECE) facility? A – A prime feature of IMAGINZ to an ECE is that it encourages undirected play and the benefits teachers perceive from these are: encouraging children to learn how to work in groups, to share, to negotiate, to resolve conflict and learn self advocacy skills. These educators believe when play is allowed to be child-driven, children practice decision making skills, move at their own pace, discover their own areas of interest and ultimately engage fully in the passions they wish to pursue. Q6 – What will IMAGINZ bring to my school education facility? A – The benefits that IMAGINZ brings to an ECE facility will also apply to the schooling environment (see A to question 5 above). Additional in the schooling environment is its ability to allow specific learning objectives and educational outcomes to be achieved. IMAGINZ will provide a base resource for building lesson plans to meet multiple learning objectives. We envisage the power of IMAGINZ will be to create a series of learning experiences overtime. Q7 – Can the product be used out doors? A – Yes, it can and this was a feature identified early from feedback received as being important. We have built this capability into the product through the selection of the polymers used and also the addition of aging protection agents called UV Stabilisers which can extend the life of polymer significantly and the use of colours that are exterior tolerant. Q8 – Why were the colours chosen? A – This was one of the harder decisions we had to make as we had our own ideas of bright and bold colours. However research indicated that clean and neutral was the trend with educational equipment and it was felt that with the indoor outdoor ability of IMAGINZ this was more apparent. Also, if particular parts had been a dominant colour they may have been perceived as having one functional use i.e. a roof tile or a tail only. Finally the neutral colours allow further complimentary art and signage be added to the creative mix fostering further engagement. This is an aspect of the design we can be flexible on though, with further feedback, so please let us know your ideas. Q9 – How do you store the product? A – Feedback was strong about having a storage system, which was both robust and easy to handle. The storage system is four large (110L) polymer containers which when loaded will weigh approximately 16 kilos each. These container have sealing lids, handles each end and 6 rolling wheels to assist in handling and moving. Q10 – How many parts and components are there with the IMAGINZ - Learning System Professional Package? A – The total number of components in the standard IMAGINZ pack is 344 parts with 13 different components (connectors, shelf, table, connector tools etc). Q11 – What is the life expectancy of the IMAGINZ? A – Our experience of polymer products, and the reasons covered in the previous questions, gives us confidence that IMAGINZ will still be performing well after many years of use within the ECE’s, schools and in the home setting (see also Q7 – Can the product be used outdoors?). Q12 – What are the safety and toxicity standards the product has to conform to? A – Safety has naturally been a high priority in our design considerations of components. We have avoided sharp edges, angles or holes where fingers may get stuck or caught. Also not making individual parts too heavy and generally making connectivity as simple as possible. Toxicity of the construction material, polymer and additive components such as colour, have been selected understanding what regulations apply. We have also studied the safety regulation around educational systems used in ECE’s and schools and know IMAGINZ conforms to the regulations governing their use. Q13 – What is the IMAGINZ made from and how? A – It is made from polymers which are strong durable and non toxic. Two different manufacturing methods were used. The framing component is made in a continuous extrusion process, as a pipe is made, where very long lengths are cut into the required standard lengths. All other components are made by the injection moulding process where heated molten polymer fills a mould to form the shape you want. It is then allowed to cool/solidify and the mould splits in half and the polymer component drops out. Q14 – Why was polymer chosen to make IMAGINZ? A – We at IMAGINZ have been producing polymer components for well over 20 years and knew that to make the product cost effective it needed to be made from polymer. We understand how to select the right polymer to suit an end application. Two different polymers are used to suit the particular performance characteristics the parts require. For example the polymer used in the frame is very strong, has a small degree of flexibility, reasonable scratch resistance and when being made maintains its measurements well which is important when other components slide and attach to each other. All the other components (panels and connectors) are made from a slightly softer polymer allowing it to have a softer feel, yield a little, as required with the connector, and still be strong when children bend, sit on and move structures about.